The atlatl hook and weight combination is not only a fascinating insight into the hunting technique that Native Americans used in the spear thrower, but also acts as a temporal maker. Webb (1939) first surmised from finds at Chiggerville, that the combination of hook and weight comprised an atlatl or spear thrower system. 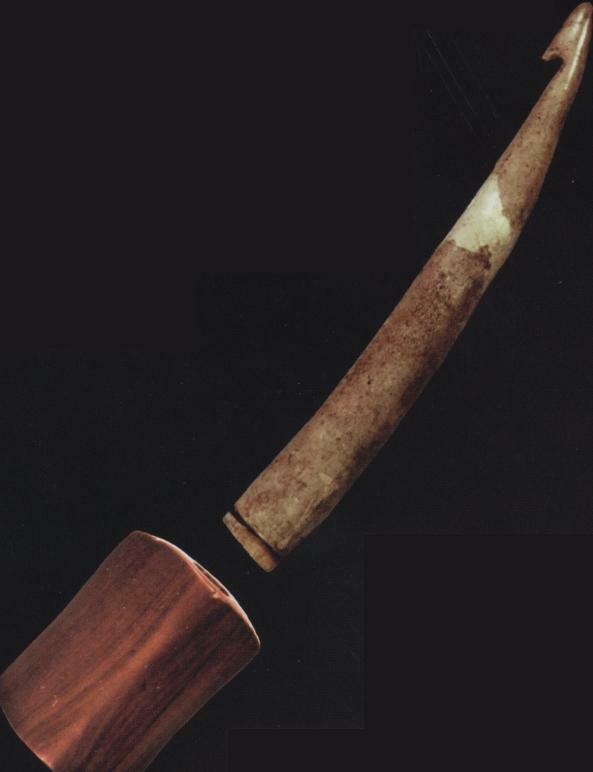 Through extensive research, Lutz (2000) has shown that atlatl hooks, like bannerstones, experienced stylistic changes through time.The earliest atlatl hook and weight system can be traced back to approximately 6500 B.P. There were four recognizable forms of the atlatl hook including "Eva", "Black Earth", "Indian Knoll", and "Slotted" (Lutz 2000). The atlatl system remained in use until the Woodland period (Lutz 2000). Temporal sequencing of these different types has proved difficult due to the lack of suitable preservation for organic remains such as antler. Because of this, well documented examples of atlatl hook and weight combinations are scarce and funtion as valuable temporal markers. This atlatl hook and weight set was found at the Crib Mound, Spencer County, Indiana, by Don Champion in the 1960's.